A powerful circular polisher that easily converts to a sander! Sometimes a dual-action polisher just isn’t enough for really tough scratches and swirls. You need the cutting power of a serious circular polisher to penetrate the clear coat and smooth over rough edges to restore your paint to its original flawless finish. The Makita 9227C 7” Polisher does just that and converts to a powerful sander. You’re getting two great machines in one! This polisher has a variable speed from 600 to 3000 rpm for super slow buffing to aggressive polishing. 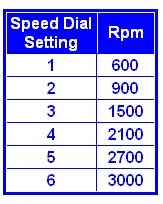 The electronic speed control maintains constant speed under load. The lock-on button allows you to use the Makita continuously at one speed. This button also allows you to use the machine as a sander on your wood projects. The 10 amp motor makes the Makita 9227C work tirelessly, no matter how often and aggressively you use it. The 6.5” Velcro backing plate accommodates 7” pads. The machine weighs only 6.6 pounds so you can work for extended periods without tiring your arms. The Makita 9227C features a large, comfortable handle and a convenient spindle lock in the polisher to make changing pads easy. 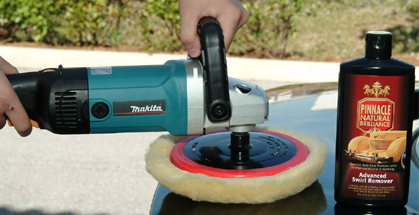 The Makita 9227C is a powerful circular polisher and should not be used by a novice detailer. The purpose of circular polishers is to remove layers of paint or clear coat down to the lowest point of the scratch until it is completely level with the surrounding surface. An inexperienced user can easily produce new swirls and burn the paint by holding the polisher in one place too long. This polisher is for experienced detailers or professionals. The Makita 9227C is excellent for avid detailers who don’t trust their vehicle to anyone else. The variable speed control and powerful motor make this polisher easier to use than many circular polishers, but still very effective. 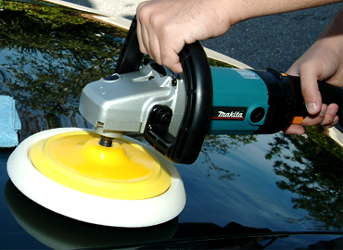 In skilled hands, the Makita 9227C Polisher will eliminate scratches, swirls and blemishes to restore the smooth, uniform finish to your vehicle.The Makita 9227C 7” Polisher comes with an included hex wrench which makes removing the back plate easy. Product Description 10 Amp motor, Variable speed (0-3,000 RPM) , Pre-set speed setting dial (from 600-3,000 RPM) for maximum control, Includes hook and loop pad and hex wrench, Weighs 6.6 lbs.